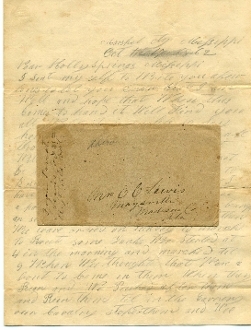 Autograph Letter Signed (ALS), Marshall City (near Holly Springs), Miss. 10/17/62. Soldier, Levi Lewis (35th Alabama Infantry , POW Camp Chase 1/65-6/65 and Southern Cross of Honor Recipient), writes in dark pencil detailing Battle of Corinth (10/3-4/62). For full transcript of letter please see scan. Included is the original franked cover plus much background information on soldier and battle. Folds, aging, tiny hole in one of the folds otherwise fine and legible. Great battle content.